Download your Far West Membership card here. 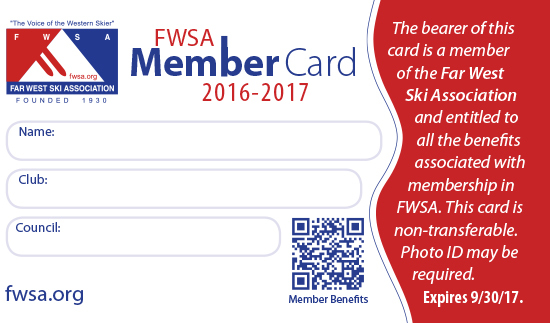 ALL Pacific Rim Alliance are also members of Far West Ski Association (FWSA) and have access to many discounts including the following. Go to the Membership Section and click on Member Benefits for complete updated list of membership benefits. Discounts up to 50% off are available. Sports Exchange, 10095 West River St, Truckee, CA, (530) 582-4510. 50% off ski/snowboard rental at www.TruckeeSportsExchange.com. Terry Sports, Steamboat, CO (2 locations) & Taos, NM (2 locations), (800) 233-7547. 20-40% off group rentals & lesser discount for online individual rentals at www.TerrySports.com. RentSkis.com (100 locations in U.S./Canada - CA, CO, ID, UT, WY, British Columbia, Alberta), (800) 544-6648. 10-25% off for online equipment rentals at www.RentSkis.com. Dominator Ski Wax at Podium Racing, 524 West Island Rd, Morgan, UT, (800) 771-1269 or (801) 876-7807. Powder House, Lake Tahoe (3 locations), CA, (530) 542-6222. 20% off rentals & 15% off gloves/goggles/clothing at www.TahoePowderHouse.com. Copeland Sports, CA, NV, OR, UT. 15% off online purchase of equipment or accessories (see FWSA website for further details) at www.SkiEssentials.com. Dave’s Skis & Boards, Lake Tahoe (4 locations), CA, (530) 583-6415. 15% off rentals & 10% off any retail item or shop repair at www.TahoeDaves.com. Replay Sports, 465 North Mill St, Aspen, CO, (970) 925-2483. Shop Tek, 5375 Orchard St, Golden, CO, (303) 278-3828. 10% off - retail products at www.SkiShopSupplies.com. The Sports Basement, San Francisco (2 locations), CA, (800) 869-6670. The Canyons, Park City, UT. 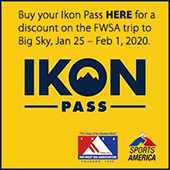 30% off lift tickets (see FWSA website for further details, blackout dates) at www.TheCanyons.com. Sun Peaks, BC, (800) 807-3257. Telluride Ski Resort, CO, (970) 728-6900. 25% off 5 day lift ticket (purchase online 7 days in advance for $275) at www.TellurideSkiResort.com. Hampton Inn & Suites Tahoe, Truckee, 11951 State Hwy 267, Truckee, CA, (530) 587-1197. Up to 43% off. Discounted price is $79 weekday/$119 weekend (some blackout dates) at www.HamptonInn.com. The Timberline Condominiums, Snow Mass Village, CO, (800) 922-4001. Free nights lodging with 2 night minimum and receive last night's lodging for free (subject to availability) at www.TheTimberline.com. Arapahoe Inn, Hwy 6 & Rasor Dr, Keystone, CO, (888) 513-9009. 20% off (with PIN #1002) at www.ArapahoeInn.com. Hotel Telluride, 199 North Cornet St, Telluride, CO, (866) 468-3501. 20% off winter rack rates (Oct-Jun some blackout dates) at www.TheHotelTelluride.com. Sundance Lodge at Big White, BC, (866) 491-7544. 15% off winter rack rates at www.SundanceBigWhite.com. Columbine Inn & Conference Center, 1288 Hwy 150, Taos Ski Valley, NM, (888) 884-5723. Alma del Monte Bed & Breakfast, 372 Hondo Seco Rd, Taos, NM, (800) 273-7203. 10% off with 2 night minimum at www.AlmaSpirit.com. Comfort Inn & Suites (Salt Lake City North area), 2437 S. Wildcat Way, Woods Cross, UT, (800) 410-9866. $75 per night per person at www.ComfortInnSaltLake.com. North American Travel  FWSA North American Ski Week. - locations have included Aspen, Lake Louise, Big Mountain, cruises. - locations have included Schladming, St. Moritz, Bormio, Kenya, South Africa, Thailand.